Claudio Ranieri has turned Leicester into title winners this season. 12 MONTHS CAN be a long time in football. This time last year, Leicester were in the midst of a great escape from a relegation battle, trying to avoid the drop in their first season back in the Premier League since 2002. Indeed, it has been only eight years since the Foxes were relegated to the third tier of English football and seven since Nigel Pearson guided them to the League One title, thereby starting to build the team that were confirmed as Premier League champions last night. Of that triumphant 2008-09 squad, just one first-team player remains to this day — midfielder Andy King, who was a key performer back then and named the club’s Young Player of the Season as a result. Now 27, King has played his part in this campaign’s success too, making 30 appearances in all competitions to date. Manager Claudio Ranieri’s meteoric rise has been similarly outlandish and improbable. This time last year, Ranieri was unemployed. Having guided Monaco to second place in Ligue 1 during the 2013-14 season, his contract with the French club was not renewed. The Italian coach subsequently took over as Greece manager, after Fernando Santos had guided the country to a last-16 spot at the 2014 World Cup, only to see them lose out on penalties to Costa Rica. A decade had passed since the Greeks’ shock Euro 2004 triumph, but it was still relatively fresh in the memory, and expectations were understandably high, following the side’s encouraging showing in Brazil. Yet Ranieri’s tenure was as brief as it was disastrous. Having signed a two-year contract with the national side worth an estimated €1.6million, he was sacked after just four games — three losses and a draw, with the final insult being a 1-0 home defeat by the Faroe Islands, which all but ended their Euro 2016 qualification hopes. “Following today’s devastating result for the national team, I take full responsibility for the most unfortunate choice of coach, which has resulted in such a poor image of the national team being put before the fans,” Giorgos Sarris, the then-President of the Greek football federation said, at the time of Ranieri’s sacking, which was announced less than four months after he had been originally installed as manager. Up until that point, Ranieri had a reputation as a very creditable coach, though one who was not quite in the same league as the Mourinhos and Guardiolas of the game. Even to this day, Ranieri seems underappreciated, perhaps because — up until last night — he had never won a top-tier league title in any country in which he had managed, despite claiming nine trophies in total during his career (now 10), as well as coaching a number of illustrious sides including Inter, Valencia, Atletico Madrid, Chelsea and Juventus. After an unremarkable playing career, Ranieri had gradually emerged from relative obscurity (he first managed Campania Puteolana, a small team in Pozzuoli) and rose through the ranks as a coach, but had ultimately acquired a reputation as a ‘near-miss’ manager after four decades spent coaching, having overseen runners-up finishes over the course of his tenures with Chelsea, Juventus, Roma and Monaco. In general, Ranieri has been viewed as a manager who could improve teams and take them to a certain level, before gracefully stepping aside and allowing someone seemingly more capable to build on the progress he instigated. But the best barometer of a manager is surely the state he leaves a club in compared to how he found it, and in most cases during his career, Ranieri comes up trumps in this regard. The underrated and highly experienced coach took over Roma, Juventus and Chelsea at difficult moments, overseeing a considerable improvement at each of these clubs, while he has also helped Fiorentina, Cagliari and Monaco earn promotion to the top flight of their respective leagues, in addition to steering both Parma and Valencia away from relegation trouble. It is surely not a complete coincidence either that all three of Juventus, Valencia and Chelsea enjoyed substantial periods of success shortly after he left each of the teams in question. There were consequently previous signs that Ranieri had the ability to develop into an elite manager. He steadied the ship after taking over Napoli during the post-Diego Maradona era, guiding them to fourth in Serie A while giving a young Gianfranco Zola his big breakthrough. Ranieri was later sacked by a Chelsea side that were undoubtedly on the up. The Italian had just guided the team to a Champions League semi-final spot and their highest-ever Premier League finish — second place behind Arsenal’s Invincibles — and though he initiated the signings of Didier Drogba, Arjen Robben and Petr Cech, Ranieri was effectively fired before the influential trio had played a single match for the Londoners. Therefore, it was largely Ranieri’s team that Mourinho guided to two successive Premier League titles — he was, for instance, responsible for the development of key young players such as John Terry and Frank Lampard — and it hardly seems beyond the realms of possibility that the Italian would have enjoyed similar levels of success had he stayed in charge at Stamford Bridge. There was therefore an overriding sense of poetic justice last December when Ranieri ensured the Portuguese coach suffered a similarly harsh fate after the reigning Premier League champions, Chelsea, were beaten 2-1 by Leicester, who simultaneously seemed to confirm their status as genuine title contenders on the night. Arguably just as impressive was Ranieri’s resuscitation of a struggling Roma side after taking charge of the club in 2010, ultimately bringing them to within two points of the Serie A title. Nevertheless, for all his achievements in football, it seemed reasonable to wonder whether Ranieri would ever recover from the Greece debacle. At 64, he is relatively old even by managers’ standards, and there weren’t exactly a queue of teams lining up to hire someone who was seen as being largely responsible for probably the single biggest humiliation in Greek football history. If it had not been for a strange and unfortunate twist of fate that saw Nigel Pearson lose his job despite guiding the club to wins in seven of their last nine matches and ultimately securing their safety in the 2014-15 campaign, Ranieri may well still have been looking for a job now. Instead, last summer, he agreed to take charge of Leicester — the 14th club of his managerial career — in a move that prompted much criticism, with club legend Gary Lineker among those to question the appointment. Yet as impressive as Leicester routinely looked towards the end of the Pearson era, it’s hard to imagine the Foxes flourishing so spectacularly without the help of the Italian. Ranieri, however, has been keen to play down his own role in this success story. Speaking last February, the coach suggested he changed little and even adjusted his own plans at the players’ behest as he sought to persevere with a winning formula. Yet it’s hardly a complete coincidence that several of Leicester’s players have hit career-best form all of a sudden. This trend can at least partially be attributed to Ranieri’s motivational and man-management skills. Renowned as a warm and friendly character, his incentive-based approach encompassing everything from one-week holidays to pizza has clearly struck a chord with his stars. 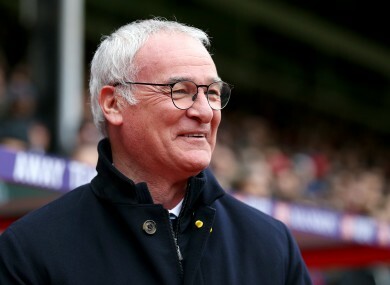 Ranieri has also handled being in this unexpected situation superbly, continually playing down the Foxes’ title chances and doing his best to alleviate all the hype and pressure that has come his side’s way of late. Moreover, there has been a clear evolution in style that Ranieri has helped implement. Whereas at the start of the campaign, they were entertaining if at times defensively suspect (as most clearly illustrated in the 5-2 loss to Arsenal back in September) and not altogether dissimilar to mid-90s Kevin Keegan-era Newcastle, in recent times, they are less adventurous but also better organised. Leicester recently won a run of five out of six matches 1-0, underlining their defensive unity and collective strength in the process. This latter style is more reflective of Ranieri’s general footballing philosophy. The high-pressing and 4-4-2 formation with largely the same starting XI for every game has perfectly suited Leicester, while Ranieri has been able to rely on arguably the best goalkeeper (Kasper Schmeichel), defender (Robert Huth), midfielder (N’Golo Kante), winger (Riyad Mahrez) and striker (Jamie Vardy) in the Premier League this season. Yet his tactical acumen and management skills aside, what’s also refreshing about Ranieri is his personality. Players who have worked with him in the past have described the manager as a father-like figure. At Roma in particular, the 64-year-old coach was viewed as a relentlessly upbeat character, maintaining this image even after his team narrowly missed out on the league title in heartbreaking fashion. Nevertheless, football’s conventional wisdom decrees that coaches need a nasty streak. In recent years, Chris Hughton and Gianfranco Zola have been among the managers charged with being “too nice” to be successful coaches. In contrast, a disconcerting majority of top-class managers have behaved awfully at times — owing to their treatment of referees alone, Jose Mourinho and Alex Ferguson deserve to be singled out for derision. Up until recently, there was, in some quarters, suggestions that Ranieri belonged to this category of ‘too-nice-to-be-successful’ managers. This season, however, the Italian coach has emphatically deconstructed this myth with a series of astonishing results that have seen Leicester climb to the top of the Premier League table and stay there for a sustained period. In a heartfelt piece for The Players’ Tribune recently entitled ‘We Do Not Dream,’ a typically modest Ranieri again focused mainly on his players’ talents and explained how he hoped Leicester’s success would inspire other young footballers “who have been told they’re not good enough”. This passage encapsulates Ranieri in a nutshell. He is unfussy. He is low key. He likes watching movies occasionally. Unlike, say, Arsene Wenger, it’s hard to imagine him intensely obsessing 24/7 over his side’s latest setback. Instead, his main worry is finding enough time to spend with his wife amid the inconvenience of his work life. Ditto, Mourinho, Guardiola and Van Gaal. None of them would be entirely comfortable spending long hours sitting serenely by a lake in the way you imagine Ranieri would be. None of them would rather take their mothers out for food instead of watching their title rivals play. And perhaps, like Leicester, Ranieri’s success is a one-off. Perhaps next season, he will revert to type and reconfirm his perceived status as a good-but-not-great manager. But maybe not. Maybe Ranieri’s success signals a shift in what’s expected of a manager now. Footballers have clearly evolved since the heady days of the 1960s and 70s, when coaches could risk scaring and even threatening stars whenever they did not perform to the required standard. Alex Ferguson has spoken of how he had to adjust his coaching style in later years owing to footballers’ inflated egos and increased sensitivity, in conjunction with their rising wages and greater sense of entitlement. Similarly, one of the theories behind Chelsea and Jose Mourinho’s implosion earlier this season was that the millennials in their squad did not respond to the Portuguese coach’s harsh criticisms in the same way that players of a different generation — the likes of Frank Lampard, John Terry, Damien Duff and Didier Drogba — tended to. Tell Arjen Robben that he is not playing well and he will likely redouble his efforts, but say the same to one of the new generation of gilded youngsters and they may decide to throw a strop. So Ranieri, rather than being an anomaly, perhaps symbolises the management style of the future with his laidback, non-confrontational approach and warm personality. And therefore, maybe Mourinho could now learn a thing or two from the man he unapologetically eclipsed at Chelsea just over a decade ago. Perhaps the tide really is turning and football will never be the same again. Email “How Claudio Ranieri and Leicester renewed our faith in football”. Feedback on “How Claudio Ranieri and Leicester renewed our faith in football”.